Ernie Elf’s Christmas Message – now on Mobile! Well, after another couple of days of festive fun and (far to much) food I sat down and decided I’d update Ernie Elf’s Christmas Message so that it worked on iOS (and Android) devices. Previously, it only supported movement using the Left and Right keys on a keyboard, meaning iOS (and Android) devices were rather out of luck. In fact, it was worse than that: the initial introduction screen required a Space key press to close and start the game. 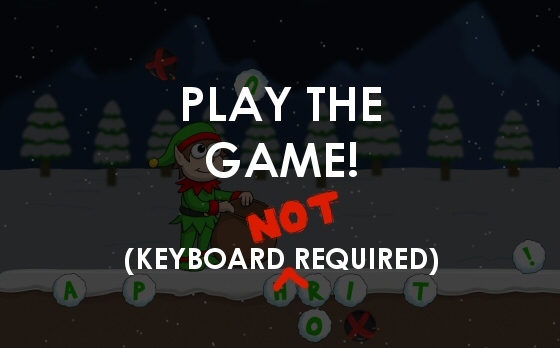 To start the game, you tap the screen. To move Ernie Elf, you tilt your device to the left and right. I worked on this witha mixture of Internet research and trial and error to understand how the accelerometer worked. I developed a simple Accelerometer Test, which uses the combination of the x and y accelerometers plus orientation to determine how far left/right the screen is tilted in relation to the current orientation. I then integrated this code into the game, using the output to determine Ernie’s horizontal (based on current orientation) velocity. // Flag to determine if our device is "upside down"
// It's landscape mode and "upside down". // It's landscape mode and the "right way up". // It's portrait mode and "upside down". // It's portrait mode and the "right way up". (The actual code I’ve used is more efficient, but the code shown here’s a bit easier to read). The result of this function is that our final variable, “accel”, will reflect how much we’ve tilted our device left and right based on the current orientation. We use this variable in moving our character, so that if we tilt left, accel’s value is negative so our character moves left, and vice-versa for right/positive. orientationChanged(); // Manually call it! You’ll notice I’ve been putting Android in brackets when mentioned. That’s because I’m not 100% sure it’s going to work as intended. For a start, this only works on Android 4.0 (Ice Cream Sandwich) and above, as that’s when Google adopted the native browser accelerometer functionality introduced previously in iOS 4.0. Also, on a Samsung Galaxy S2 this was tested on the angles reported by the orientationchange event appear to be 180 degrees out from iOS. This means that the “upsideDown” flag is set incorrectly at all times and so Ernie moves in the opposite direction to that which he should! Eek. To fix this I’ve added a simple Android OS check and said “If it’s Android, then inverse Ernie’s direction”. It’s dirty, but it works. At least on an S2. I’ve not got an ICS+ Android device to directly test this on (I’ve been remotely testing by hassling my mate Reef (thanks Reef!!) and didn’t want to drive her insane 🙂 ), and it looks like it might be different on different devices from what I read on Stackoverflow. Fun! If you’ve any idea why iOS and Android (well, ICS on an S2) are reporting their orientation angles with what seems like a 180 degree difference, please let me know! Anyway… it’s alive on iOS and Android! Wooh! UPDATE (28/12/2012 13:57): I’ve added touch-based movement functionality for Android-only OSes of less than 4.0 – so you can now play this on Android < 4.0. When you play, you'll see two big translucent buttons on the left and right of the screen. Touch them to move Ernie! Pat P.S. Big thanks to Gary for his extensive testing help on iPad and iPhone and Reef for her remote testing on the S2!